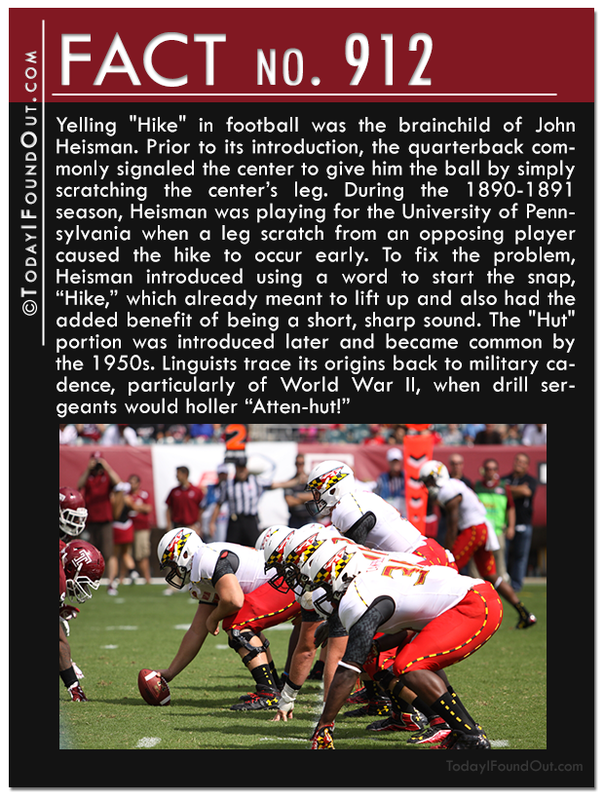 With the Super Bowl this weekend, we thought we’d do a “Football facts” roundup to help you impress your buddies with amazingly interesting Football knowledge. 891) Buffalo wings were invented sometime around the 1960s by either John Young or Frank and Teressa Bellissimo in Buffalo, New York. The spreading of this tasty appetizer was relatively slow until Football stepped in. What happened? 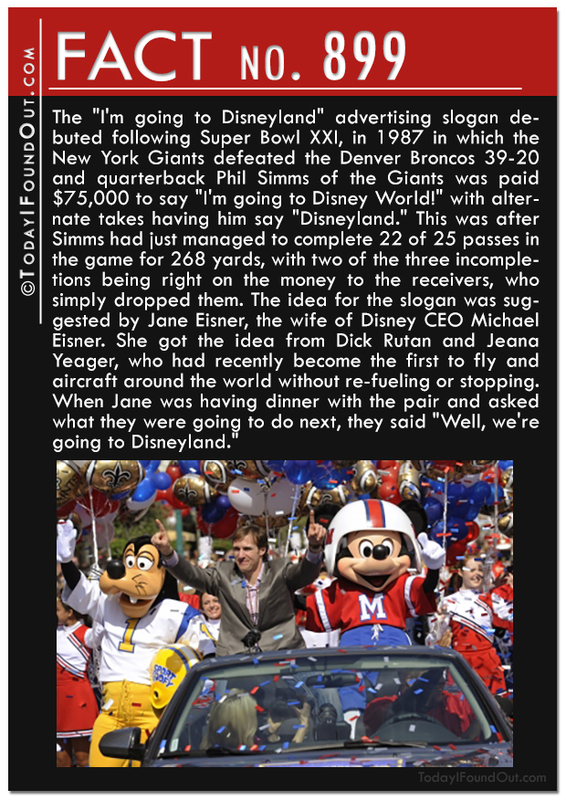 From 1990-1993, the Buffalo Bills made it to the Super Bowl four consecutive seasons. During this time, the media covering the team also did features on the region itself, including talking quite a bit about local food and particularly highlighting these spicy, fried chicken wings. 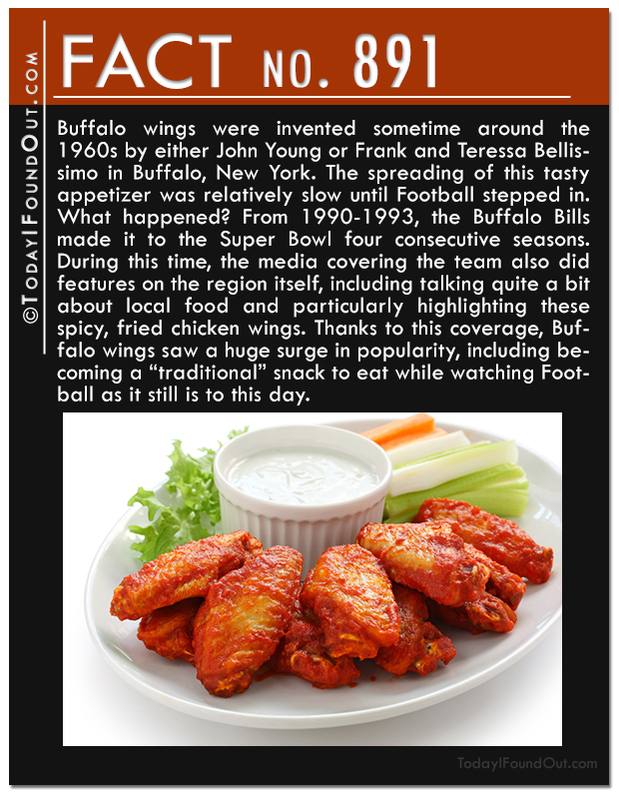 Thanks to this coverage, Buffalo wings saw a huge surge in popularity, including becoming a “traditional” snack to eat while watching Football as it still is to this day. 893) If you’re wondering why American Football is called that and “European” Football is called “Soccer” in America, Soccer was once a popular name for Football in Britain in the sport’s earliest days. When the rules for the sport were first being defined, it was named “Association Football” to distinguish it from the other forms of football commonly played. 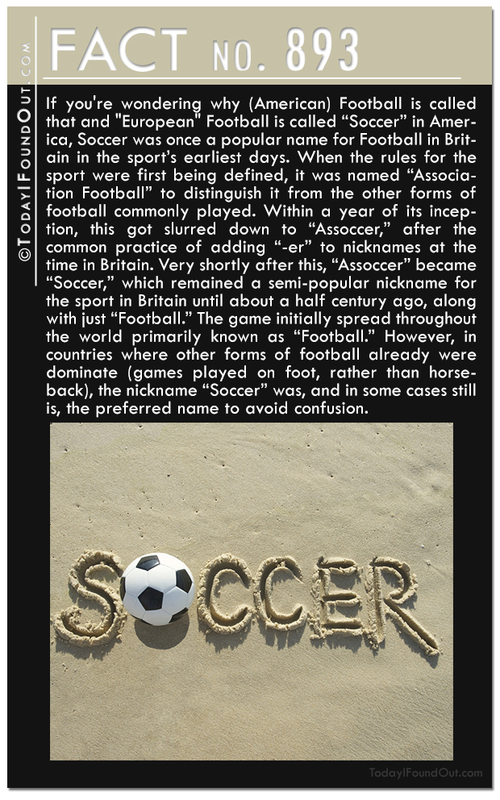 Within a year of its inception, this got slurred down to “Assoccer,” after the common practice of adding “-er” to nicknames at the time in Britain. Very shortly after this, “Assoccer” became “Soccer,” which remained a semi-popular nickname for the sport in Britain until about a half century ago, along with just “Football.” The game initially spread throughout the world primarily known as “Football.” However, in countries where other forms of football already were dominate (games played on foot, rather than horseback), the nickname “Soccer” was, and in some cases still is, the preferred name to avoid confusion. 894) In the early days, Super Bowls generally featured college and high school marching bands for the halftime show. This gradually changed to featuring various singers and other such performers. The first halftime show to feature only one performer was during Super Bowl XXVII when Michael Jackson was hired by the NFL to perform in order to boost ratings. 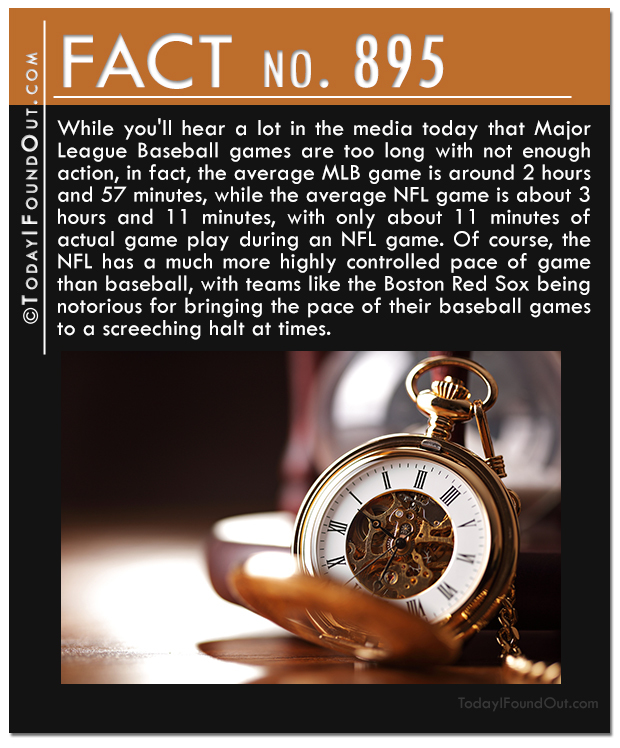 895) While you’ll hear a lot in the media today that Major League Baseball games are too long with not enough action, in fact, the average MLB game is around 2 hours and 57 minutes, while the average NFL game is about 3 hours and 11 minutes, with only about 11 minutes of actual game play during an NFL game. Of course, the NFL has a much more highly controlled pace of game than baseball, with teams like the Boston Red Sox being notorious for bringing the pace of their baseball games to a screeching halt at times. 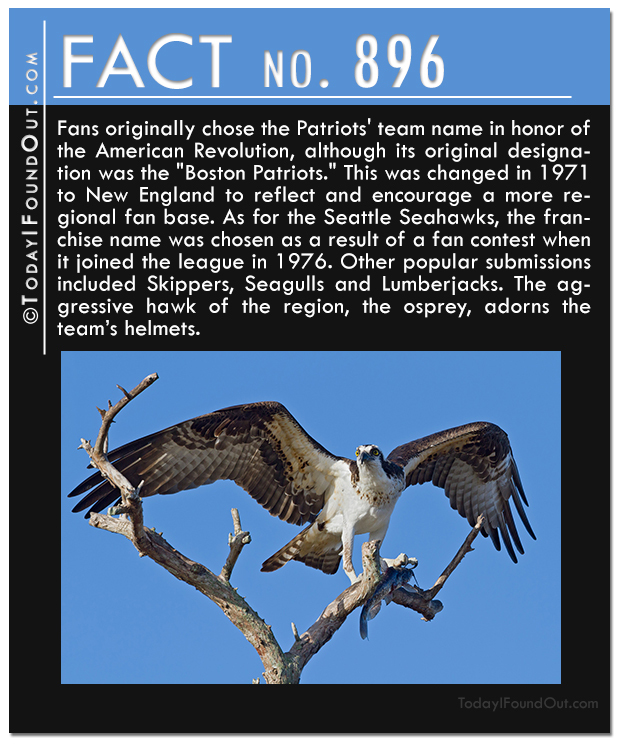 896) Fans originally chose the Patriots’ team name in honor of the American Revolution, although its original designation was the “Boston Patriots.” This was changed in 1971 to New England to reflect and encourage a more regional fan base. As for the Seattle Seahawks, the franchise name was chosen as a result of a fan contest when it joined the league in 1976. Other popular submissions included Skippers, Seagulls and Lumberjacks. The aggressive hawk of the region, the osprey, adorns the team’s helmets. 897) The first time the Goodyear blimps were used during a sporting event was during the 1960 Orange Bowl which pitted Georgia against Missouri (Georgia coming out on top 14-0). 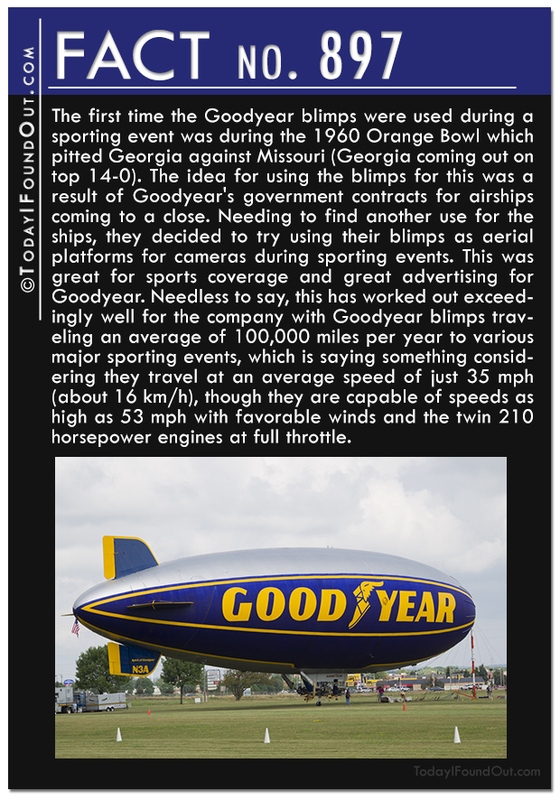 The idea for using the blimps for this was a result of Goodyear’s government contracts for airships coming to a close. Needing to find another use for the ships, they decided to try using their blimps as aerial platforms for cameras during sporting events. This was great for sports coverage and great advertising for Goodyear. Needless to say, this has worked out exceedingly well for the company with Goodyear blimps traveling an average of 100,000 miles per year to various major sporting events, which is saying something considering they travel at an average speed of just 35 mph (about 16 km/h), though they are capable of speeds as high as 53 mph with favorable winds and the twin 210 horsepower engines at full throttle. 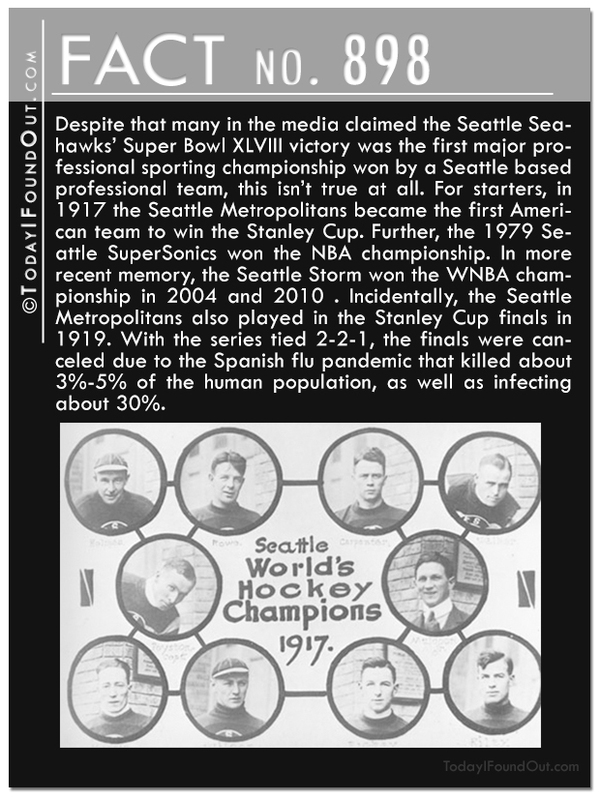 898) Despite that many in the media claimed the Seattle Seahawks’ Super Bowl XLVIII victory was the first major professional sporting championship won by a Seattle based professional team, this isn’t true at all. For starters, in 1917 the Seattle Metropolitans became the first American team to win the Stanley Cup. Further, the 1979 Seattle SuperSonics won the NBA championship. In more recent memory, the Seattle Storm won the WNBA championship in 2004 and 2010 . Incidentally, the Seattle Metropolitans also played in the Stanley Cup finals in 1919. With the series tied 2-2-1, the finals were canceled due to the Spanish flu pandemic that killed about 3%-5% of the human population, as well as infecting about 30%. 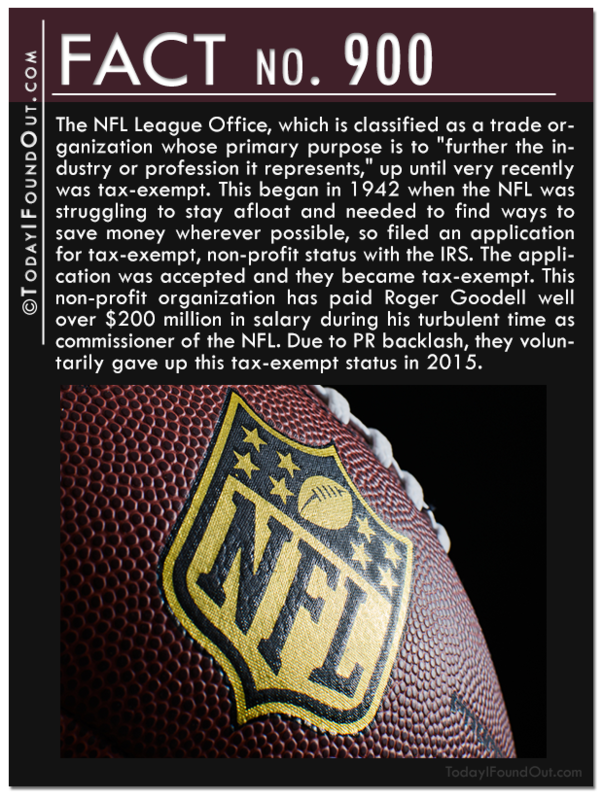 900) The NFL League Office, which is classified as a trade organization whose primary purpose is to “further the industry or profession it represents,” is tax-exempt. This began in 1942 when the NFL was struggling to stay afloat and needed to find ways to save money wherever possible, so filed an application for tax-exempt, non-profit status with the IRS. The application was accepted and they’ve been tax-exempt ever since. This non-profit organization has paid Roger Goodell well over $200 million in salary during his turbulent time as commissioner of the NFL. Ultimately due to PR backlash, the NFL voluntarily gave up their tax-exempt status in 2015. 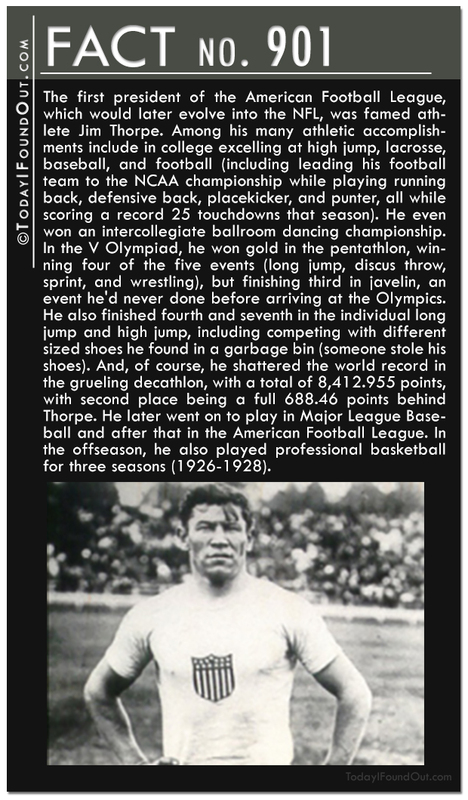 901) The first president of the American Football League, which would later evolve into the NFL, was famed athlete Jim Thorpe. Among his many athletic accomplishments include in college excelling at high jump, lacrosse, baseball, and football (including leading his football team to the NCAA championship while playing running back, defensive back, placekicker, and punter, all while scoring a record 25 touchdowns that season). He even won an intercollegiate ballroom dancing championship. In the V Olympiad, he won gold in the pentathlon, winning four of the five events (long jump, discus throw, sprint, and wrestling), but finishing third in javelin, an event he’d never done before arriving at the Olympics. He also finished fourth and seventh in the individual long jump and high jump, including competing with different sized shoes he found in a garbage bin (someone stole his shoes). And, of course, he shattered the world record in the grueling decathlon, with a total of 8,412.955 points, with second place being a full 688.46 points behind Thorpe. He later went on to play in Major League Baseball and after that in the American Football League. In the offseason, he also played professional basketball for three seasons (1926-1928). 902) Organized cheerleading, which started out as an all-male activity, is traditionally credited as having started on the 2nd of November 1898. On this day, student Johnny Campbell of the University of Minnesota reportedly directed a crowd at a football game into cheering “Rah, Rah, Rah! Ski-u-mah, Hoo-Rah! Hoo-Rah! Varsity! Varsity! Varsity, Minn-e-So-Tah!”, making Campbell the very first known documented cheerleader. From then, the University of Minnesota organized a “yell leader” squad of six male students to lead the crowd at football and basketball games, which in turn led to an all male cheer fraternity called Gamma Sigma. It wasn’t until almost 25 years later, in 1923, that women cheerleaders joined in the activity. 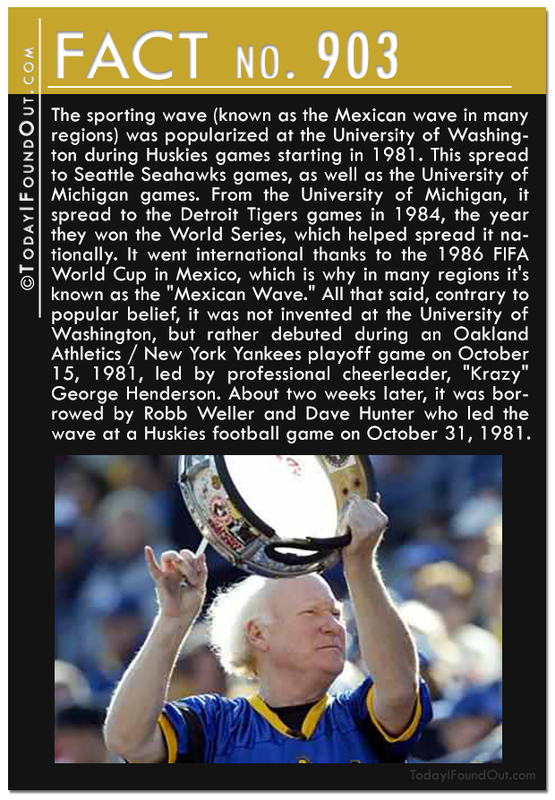 903) The sporting wave (known as the Mexican wave in many regions) was popularized at the University of Washington during Huskies games starting in 1981. This spread to Seattle Seahawks games, as well as the University of Michigan games. From the University of Michigan, it spread to the Detroit Tigers games in 1984, the year they won the World Series, which helped spread it nationally. It went international thanks to the 1986 FIFA World Cup in Mexico, which is why in many regions it’s known as the “Mexican Wave.” All that said, contrary to popular belief, it was not invented at the University of Washington, but rather debuted during an Oakland Athletics / New York Yankees playoff game on October 15, 1981, led by professional cheerleader, “Krazy” George Henderson. About two weeks later, it was borrowed by Robb Weller and Dave Hunter who led the wave at a Huskies football game on October 31, 1981. 904) Digitally projecting yellow lines onto the fields during football game broadcasts is no simply task. Before the game starts, technicians make a digital 3-D model of the field being broadcast. They also use a special camera mount that records all of the camera’s movements. This information is fed to the computer so it knows what each camera is doing in real-time. It can then take the 3-D model of the field, the locations and actions of the cameras, and orient the first-down line accordingly. The ability to show the yellow line on the field and not on anyone or anything that it crosses is accomplished by using layers of color. The technicians input different color layers into the computer before each game. One layer usually has colors like the greens and browns of the field. These colors will automatically be converted to yellow when and where the technician draws the yellow line. A cornucopia of other colors that could show up on the line (things like the players and officials’ uniforms, shoes, flesh, the ball itself, or any overladen graphics) are added into a separate visual layer. If any color other than the calibrated greens and browns get in the way of the yellow line, those colors remain and the yellow line disappears in those locations. 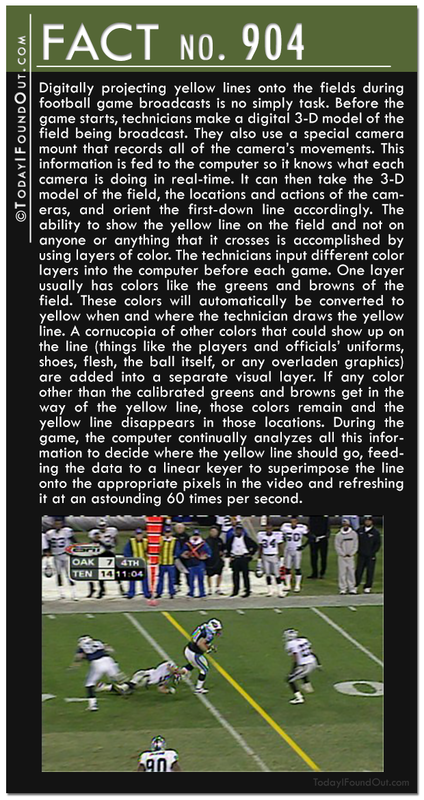 During the game, the computer continually analyzes all this information to decide where the yellow line should go, feeding the data to a linear keyer to superimpose the line onto the appropriate pixels in the video and refreshing it at an astounding 60 times per second. 905) The first person credited with using eye black during a major sporting event was Andy Farkas of the Washington Redskins. He was photographed with it on in a game against the Philadelphia Eagles in 1942. Today, it’s fairly commonly used by athletes trying to cut down on glare that reaches their eyes. But does it work? The short answer is, possibly. There has been only one seemingly legitimate study that tested this, done by Brian M. De Broff, MD and Patricia J. Pahk, MD in 2003; it was published in the Journal of American Medical Association. 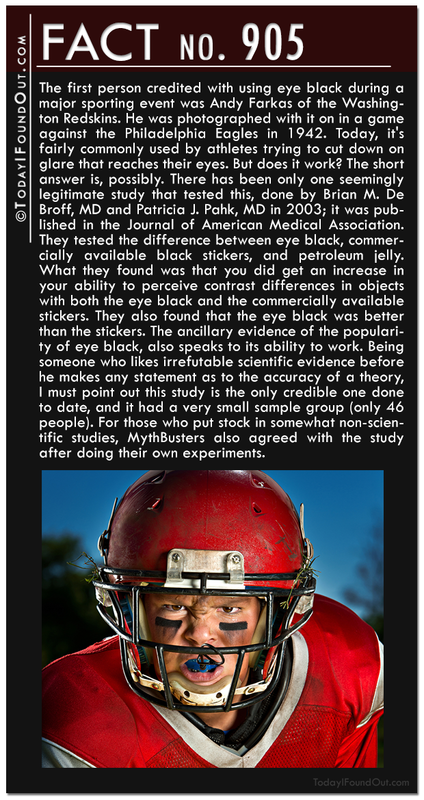 They tested the difference between eye black, commercially available black stickers, and petroleum jelly. What they found was that you did get an increase in your ability to perceive contrast differences in objects with both the eye black and the commercially available stickers. They also found that the eye black was better than the stickers. The ancillary evidence of the popularity of eye black, also speaks to its ability to work. Being someone who likes irrefutable scientific evidence before he makes any statement as to the accuracy of a theory, I must point out this study is the only credible one done to date, and it had a very small sample group (only 46 people). For those who put stock in somewhat non-scientific studies, MythBusters also agreed with the study after doing their own experiments. 906) The tradition of having the Detroit Lions play on Thanksgiving stemmed from the even older tradition of various football programs at high schools and colleges often holding football games on Thanksgiving. Radio executive and owner of the Detroit Lions, G.A. Richards, decided to try to bring the same tradition to the NFL to help increase the popularity of the Lions. After getting permission from the NFL, Richards used his considerable influence in radio to convince NBC that they should broadcast this game on the radio all across the United States, something that had never been done before for an NFL game. The game ended up being a huge success, broadcast across the nation on over 94 different radio stations. 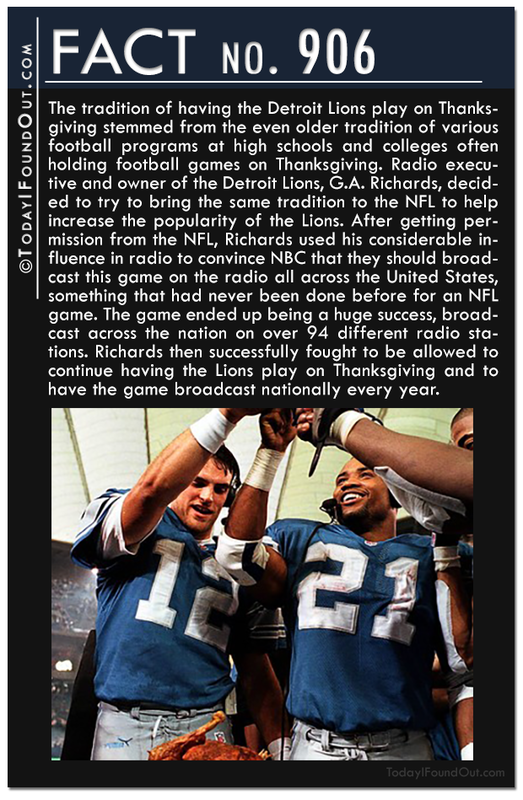 Richards then successfully fought to be allowed to continue having the Lions play on Thanksgiving and to have the game broadcast nationally every year. 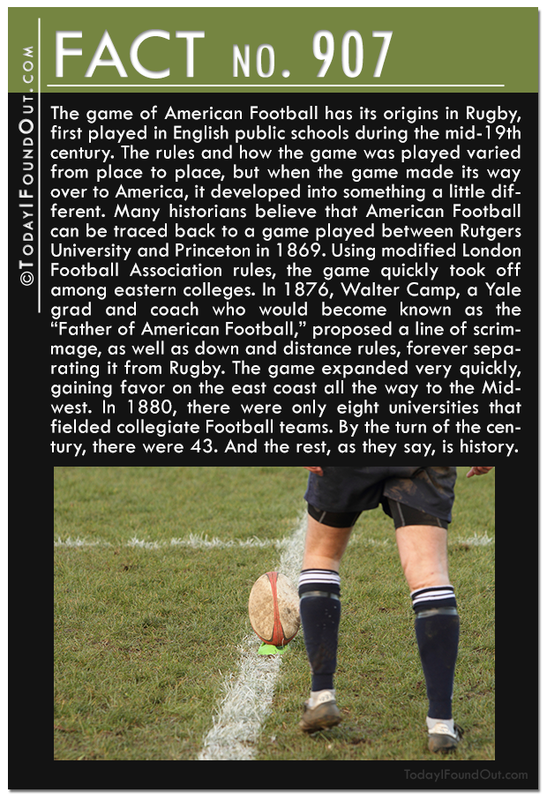 907) The game of American Football has its origins in Rugby, first played in English public schools during the mid-19th century. The rules and how the game was played varied from place to place, but when the game made its way over to America, it developed into something a little different. 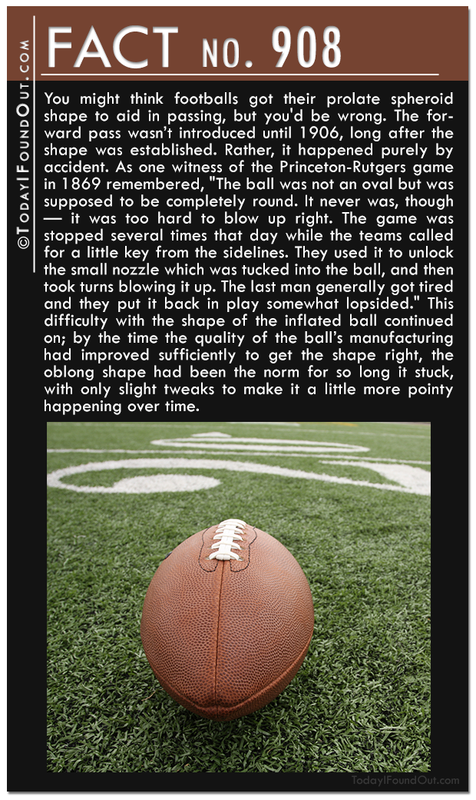 Many historians believe that American Football can be traced back to a game played between Rutgers University and Princeton in 1869. Using modified London Football Association rules, the game quickly took off among eastern colleges. In 1876, Walter Camp, a Yale grad and coach who would become known as the “Father of American Football,” proposed a line of scrimmage, as well as down and distance rules, forever separating it from Rugby. The game expanded very quickly, gaining favor on the east coast all the way to the Midwest. In 1880, there were only eight universities that fielded collegiate Football teams. By the turn of the century, there were 43. And the rest, as they say, is history. 908) You might think footballs got their prolate spheroid shape to aid in passing, but you’d be wrong. The forward pass wasn’t introduced until 1906, long after the shape was established. Rather, it happened purely by accident. As one witness of the Princeton-Rutgers game in 1869 remembered, “The ball was not an oval but was supposed to be completely round. It never was, though — it was too hard to blow up right. The game was stopped several times that day while the teams called for a little key from the sidelines. They used it to unlock the small nozzle which was tucked into the ball, and then took turns blowing it up. The last man generally got tired and they put it back in play somewhat lopsided.” This difficulty with the shape of the inflated ball continued on; by the time the quality of the ball’s manufacturing had improved sufficiently to get the shape right, the oblong shape had been the norm for so long it stuck, with only slight tweaks to make it a little more pointy happening over time. 909) Championship Football games are called “bowls” thanks to a stadium designed by Myron Hunt, Rose Bowl. 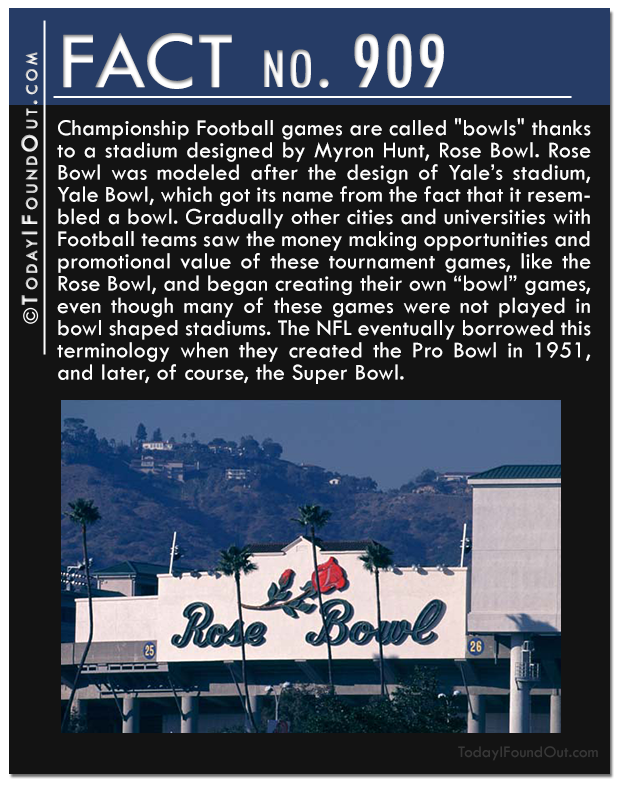 Rose Bowl was modeled after the design of Yale’s stadium, Yale Bowl, which got its name from the fact that it resembled a bowl. Gradually other cities and universities with Football teams saw the money making opportunities and promotional value of these tournament games, like the Rose Bowl, and began creating their own “bowl” games, even though many of these games were not played in bowl shaped stadiums. The NFL eventually borrowed this terminology when they created the Pro Bowl in 1951, and later, of course, the Super Bowl. 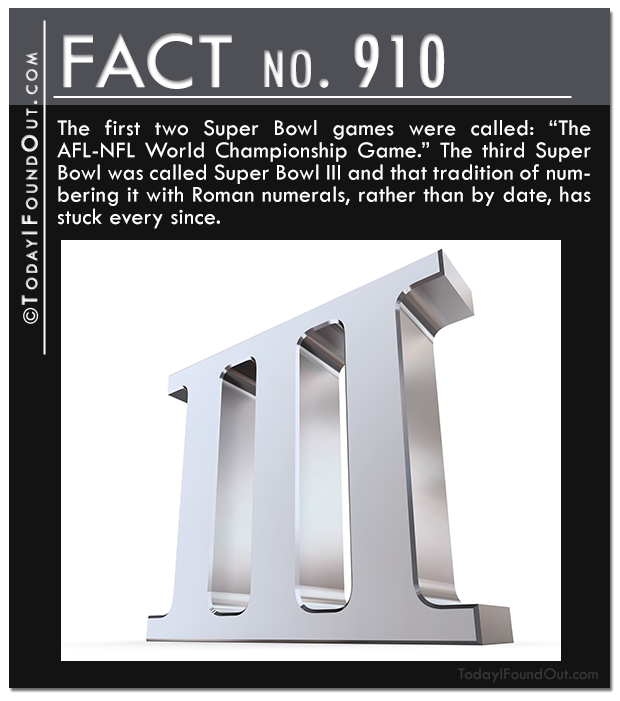 910) The first two Super Bowl games were called: “The AFL-NFL World Championship Game.” The third Super Bowl was called Super Bowl III and that tradition of numbering it with Roman numerals, rather than by date, has stuck every since. 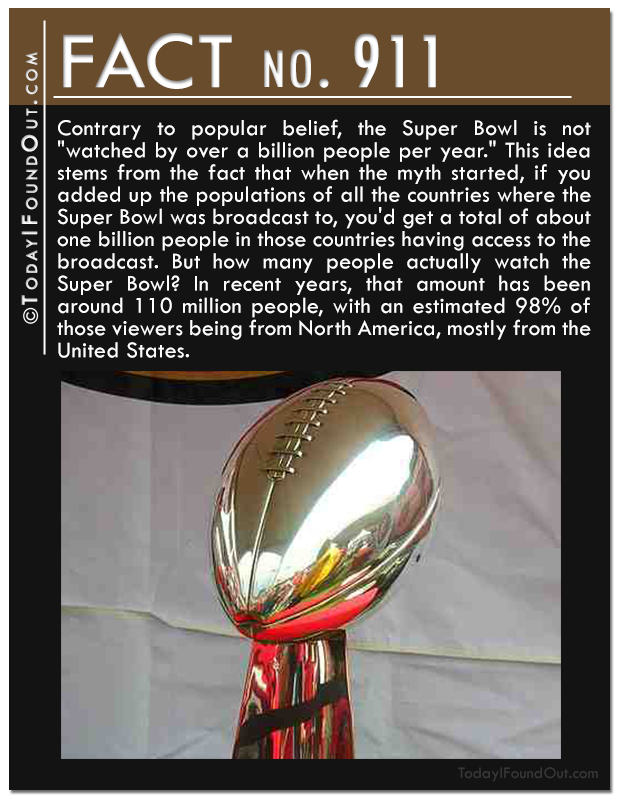 911) Contrary to popular belief, the Super Bowl is not “watched by over a billion people per year.” This idea stems from the fact that when the myth started, if you added up the populations of all the countries where the Super Bowl was broadcast to, you’d get a total of about one billion people in those countries having access to the broadcast. But how many people actually watch the Super Bowl? In recent years, that amount has been around 110 million people, with an estimated 98% of those viewers being from North America, mostly from the United States. 913) While many people call footballs “pigskins,” the official nickname of the football used by the NFL is “The Duke” after Wellington Mara. 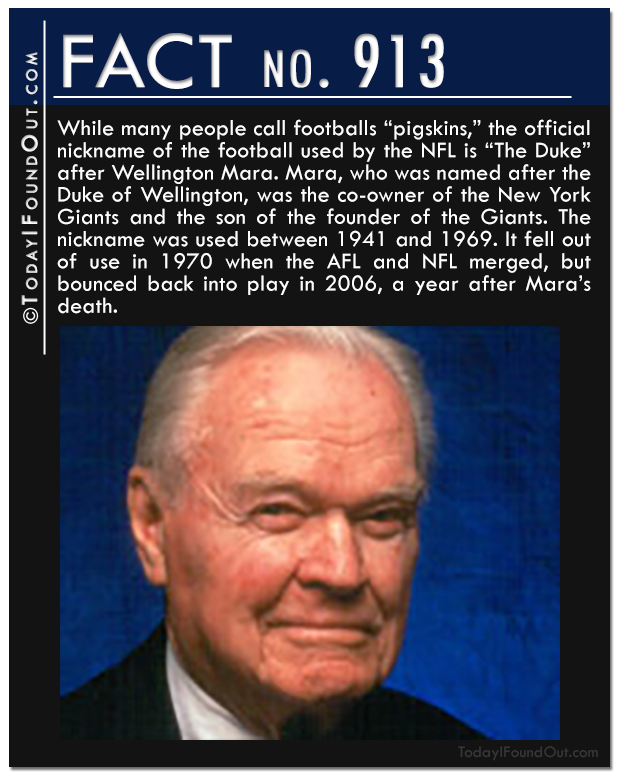 Mara, who was named after the Duke of Wellington, was the co-owner of the New York Giants and the son of the founder of the Giants. The nickname was used between 1941 and 1969. It fell out of use in 1970 when the AFL and NFL merged, but bounced back into play in 2006, a year after Mara’s death. 914) Contrary to popular belief, footballs were never literally made out of pigskin, despite the nickname. 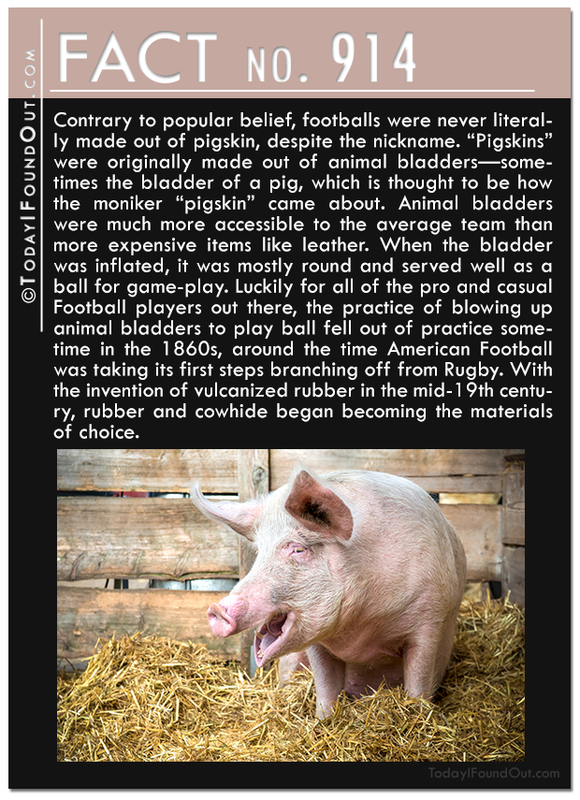 “Pigskins” were originally made out of animal bladders—sometimes the bladder of a pig, which is thought to be how the moniker “pigskin” came about. Animal bladders were much more accessible to the average team than more expensive items like leather. When the bladder was inflated, it was mostly round and served well as a ball for game-play. Luckily for all of the pro and casual Football players out there, the practice of blowing up animal bladders to play ball fell out of practice sometime in the 1860s, around the time American Football was taking its first steps branching off from Rugby. With the invention of vulcanized rubber in the mid-19th century, rubber and cowhide began becoming the materials of choice. 915) Since 1955, the official NFL footballs have been made at the Wilson factory in Ada, Ohio. 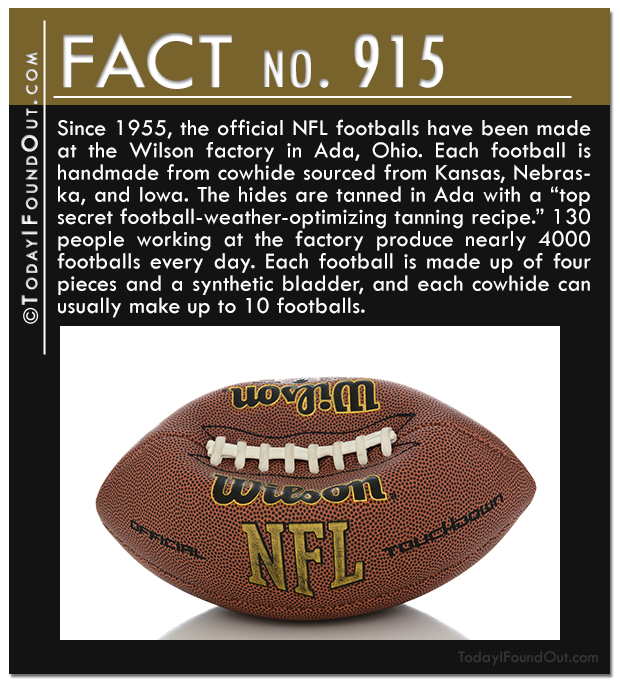 Each football is handmade from cowhide sourced from Kansas, Nebraska, and Iowa. The hides are tanned in Ada with a “top secret football-weather-optimizing tanning recipe.” 130 people working at the factory produce nearly 4000 footballs every day. Each football is made up of four pieces and a synthetic bladder, and each cowhide can usually make up to 10 footballs. 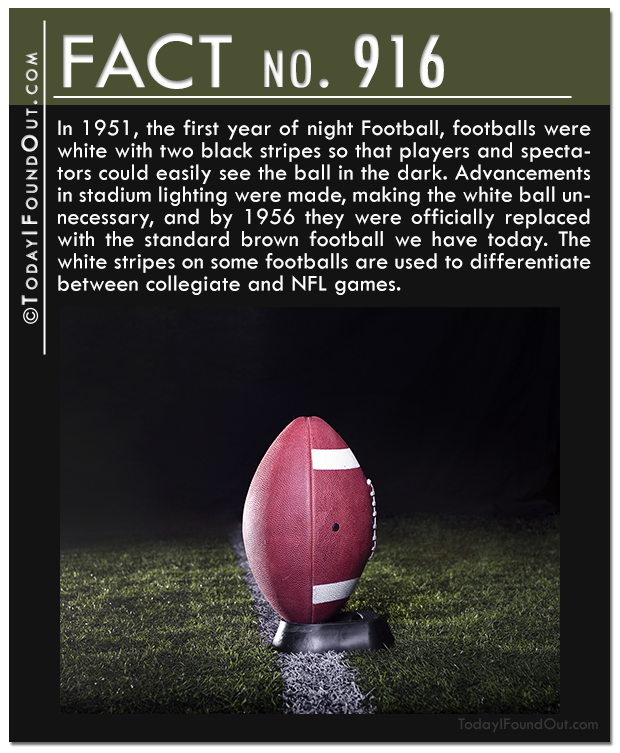 916) In 1951, the first year of night Football, footballs were white with two black stripes so that players and spectators could easily see the ball in the dark. Advancements in stadium lighting were made, making the white ball unnecessary, and by 1956 they were officially replaced with the standard brown football we have today. The white stripes on some footballs are used to differentiate between collegiate and NFL games. 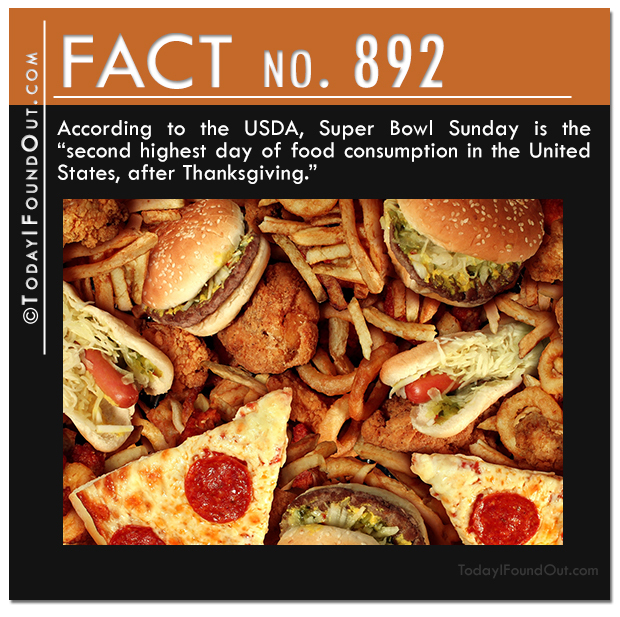 Fact 897 – you have converted the speed the wrong way. As for #891, nobody in Buffalo, NY, calls chicken wings “Buffalo wings”, although if other people want to, that’s fine. Because I was born and raised nearby, though, it irks me beyond belief if they spell “Buffalo wings” with a small “b”. Chicken wings do not come from bison, people.